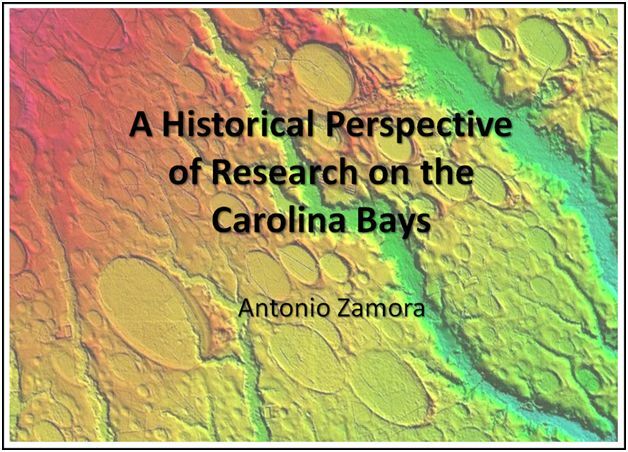 Historical Perspective of Research on the Carolina Bays. 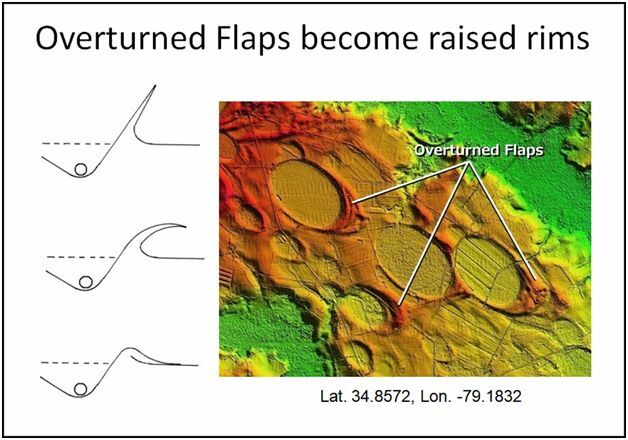 1) The Carolina Bays are large elliptical geological features that were discovered after the invention of the airplane. 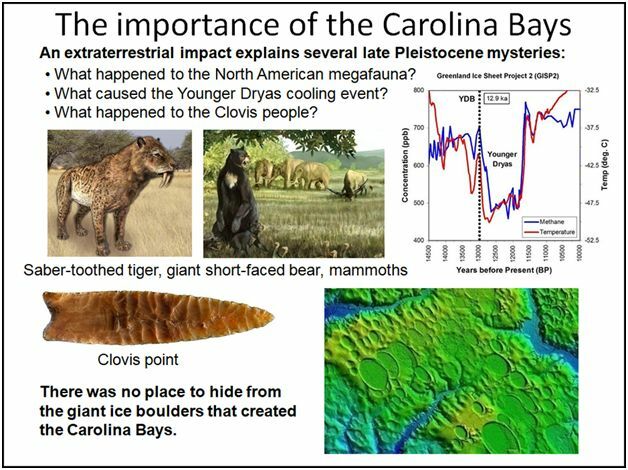 The origin of the Carolina Bays has been the subject of vigorous controversies between proponents of impact hypotheses and those favoring terrestrial mechanisms. 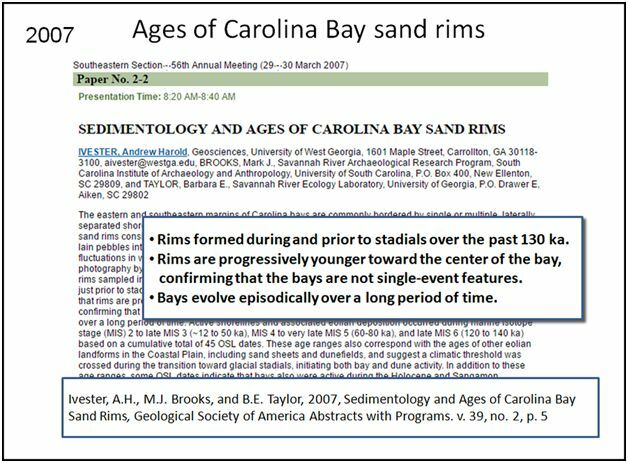 This presentation shows how improvements in technology have given us a clearer picture of how the Carolina Bays formed. 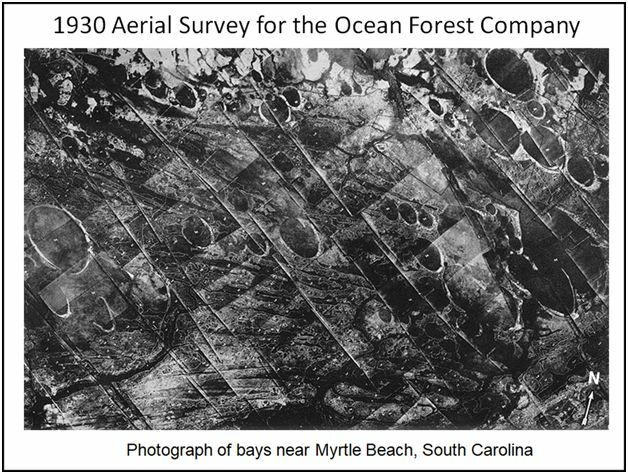 2) In 1930, the Ocean Forest Company hired Fairchild Aerial Surveys to photograph five hundred square miles of coastal plain near Myrtle Beach in South Carolina. The photographs revealed a large number of elliptical features aligned toward the northwest. Many of the bays have been given names. The large bay in the left of this image is 1,920 meters long, and it is called Cotton Patch Bay by the US Geological Survey. The arrow in the lower right corner points to the North. 3) In 1933, Melton and Schriever from the University of Oklahoma published an analysis of the bays. 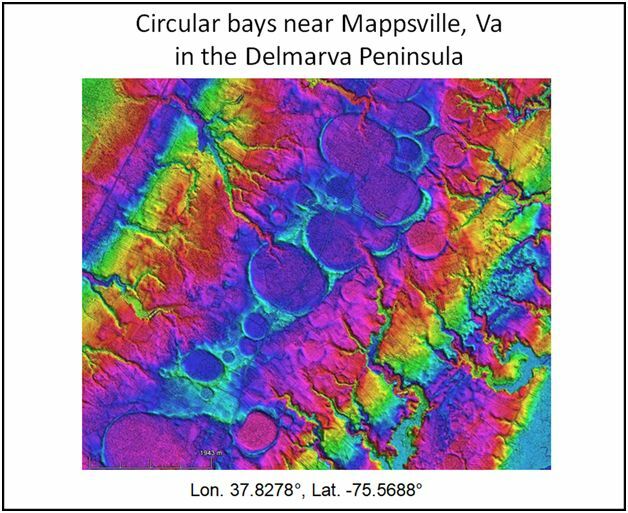 The authors described the elevated sandy rims, the fact that overlapping bays preserve their elliptical outline, and that small bays have a more circular shape than larger bays. Melton and Schriever remarked that “these features are not known to exist elsewhere on the Earth's surface”. After considering eolian, lacustrine and other terrestrial mechanisms, the authors proposed that the bays most likely were created by a meteorite shower coming from the northwest. However, they concluded that the impact hypothesis could not be confirmed because the rims did not contain bed-rock fragments, and there were no traces of meteorite fragments or magnetic anomalies in the bays. 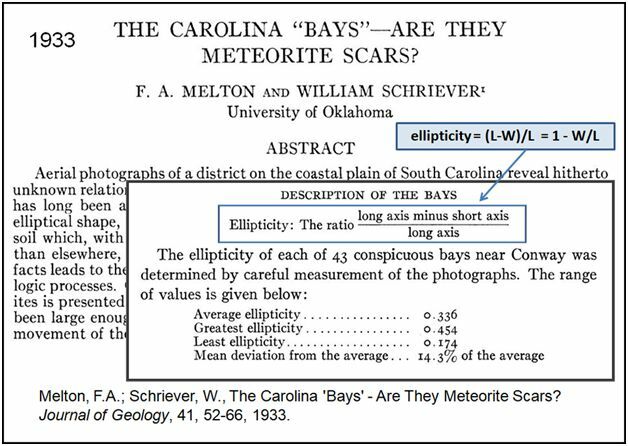 Melton and Schriever introduced ellipticity as an important characteristic of the Carolina Bays. Ellipticity is defined as the long axis minus the short axis divided by the long axis, which is equal to one minus the width-to-length ratio. 4) The extraterrestrial impact hypothesis was immediately criticized and rejected. 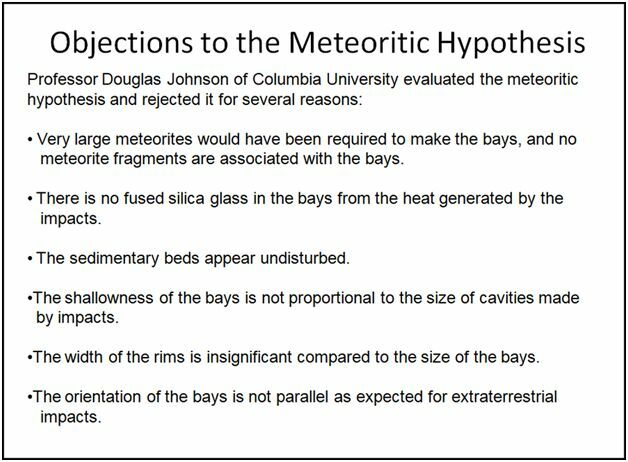 Professor Douglas Johnson of Columbia University noted that the bays had no meteorite fragments or fused silica. Also, the sedimentary beds of the bays appeared undisturbed, the width of the rims was too small compared to the size of the bays, and the orientation of the bays was not parallel as would be expected for an extraterrestrial meteorite shower. 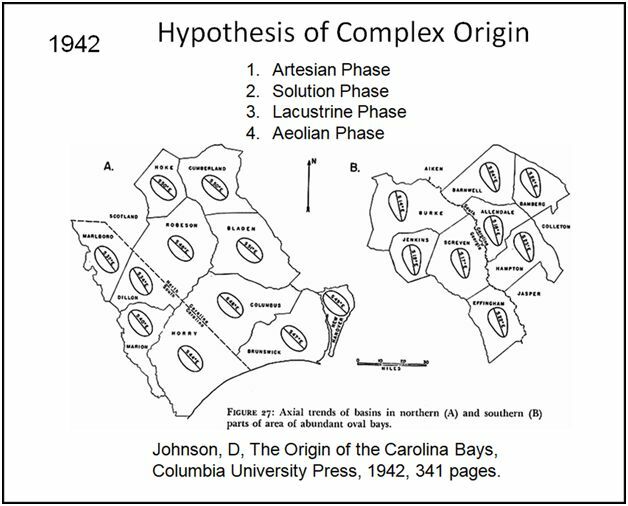 5) Professor Johnson proposed his own hypothesis of complex origin in which water flow from artesian springs operating in part by solution created shallow basins that formed lakes. Wave action then shaped the bays, and wind-blown sand formed the rims. Johnson’s hypothesis did not specify how the overlapping bays were produced. From the aerial photographs, Johnson found that the northern bays illustrated on the left (A) are oriented toward the northwest, whereas southern bays (B) are more oriented toward the north. Johnson described the bays as “oval”, rather than elliptical, and he did not attribute any particular significance to their shape. 6) In 1952, Prof. Prouty from the University of North Carolina, opposed Johnson’s terrestrial hypothesis. He noted that statistical studies of the orientations show that smaller bays have a greater divergence from the mean than larger bays. Smaller bays also show greater variation in ellipticity than larger bays. Melton and Schriever had proposed that this variation in ellipticity could be explained by the effect of the atmosphere on the meteorites. Smaller projectiles would be slowed down more than the larger projectiles, and they would impact the Earth with a greater vertical component, thus creating scars with smaller ellipticity, or less elongated in shape. Prouty concluded that these characteristics and the heart-shaped bays are most satisfactorily explained by impacts. He proposed that the impacts were accompanied by air blasts from shock waves that blew away surface sand. 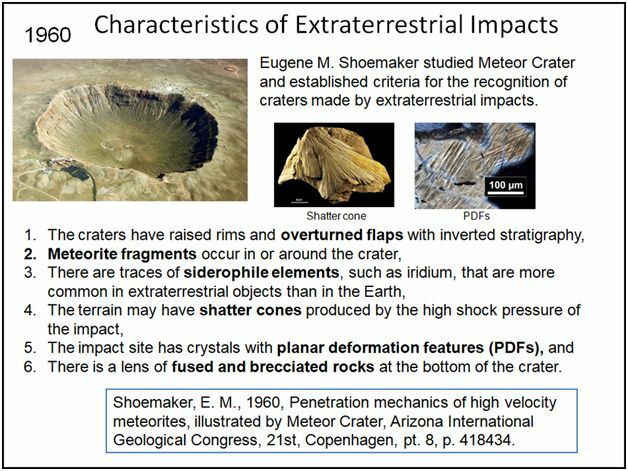 7) In 1960, Eugene Shoemaker established criteria for distinguishing extraterrestrial impact sites from craters created by solution, volcanism or other terrestrial processes. The criteria can be used even after substantial degradation of an impact site by wind and water erosion. 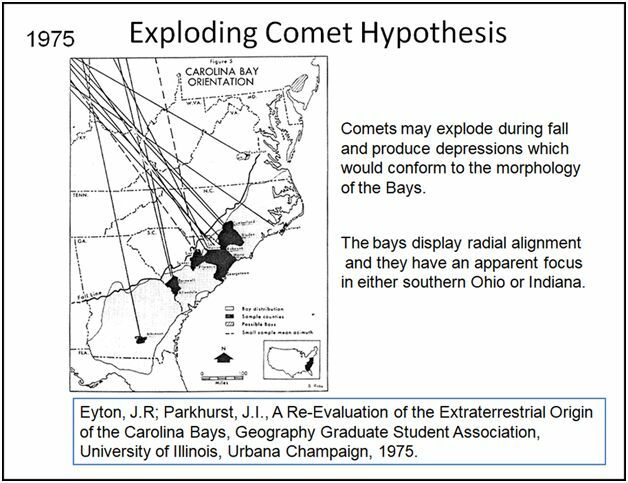 8) In 1975, Eyton and Parkhurst attempted to explain the Carolina Bays as the result of airbursts caused by explosions of icy comet fragments with some of the characteristics of the 1908 event over Tunguska in Siberia. The authors drew lines along the bay azimuths, which appeared to converge in southern Ohio or Indiana. This suggested the place where the comet had entered the atmosphere and started to disintegrate. 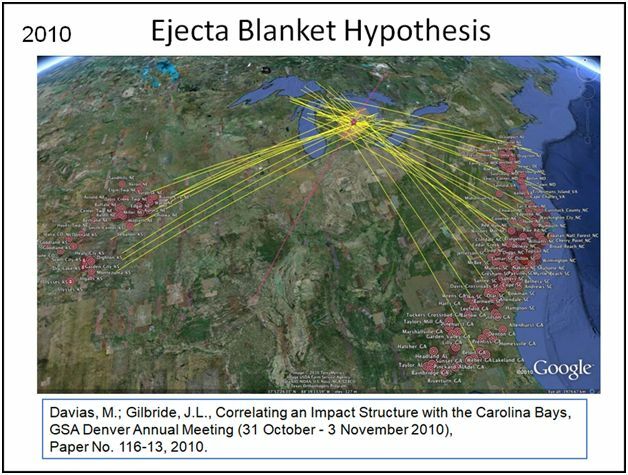 The paper by Eyton and Parkhurst did not get much attention because there was no physical evidence of the proposed airbursts, and by this time there was little support the extraterrestrial origin of the Carolina Bays. 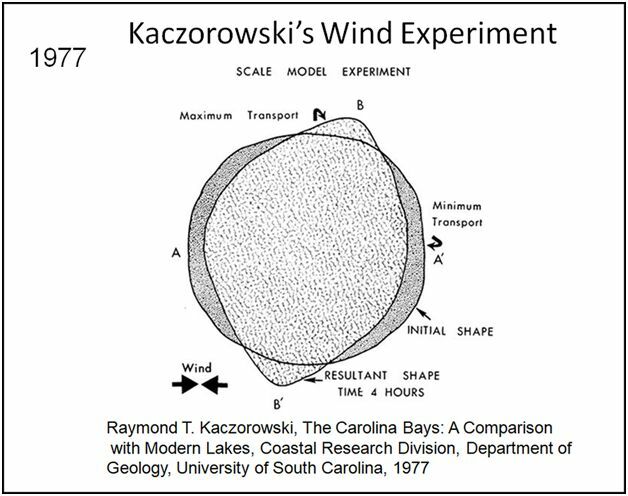 9) In 1977, Raymond Kaczorowski wrote a thesis describing an experiment on a sand table using a fan to simulate the winds that he proposed shaped the Carolina Bays and their rims. The wind direction in the graphic denotes an alternating wind direction, reversing 180º at regular intervals during the experiment. The wind modified the shape of the original pool, but it did not produce an elliptical shape. Kaczorowski’s thesis had only a limited distribution within the Geology Department of the University of South Carolina and it was never published in a peer-reviewed journal, but it has been widely referenced in publications by proponents of the eolian and lacustrine hypotheses of Carolina Bay formation. 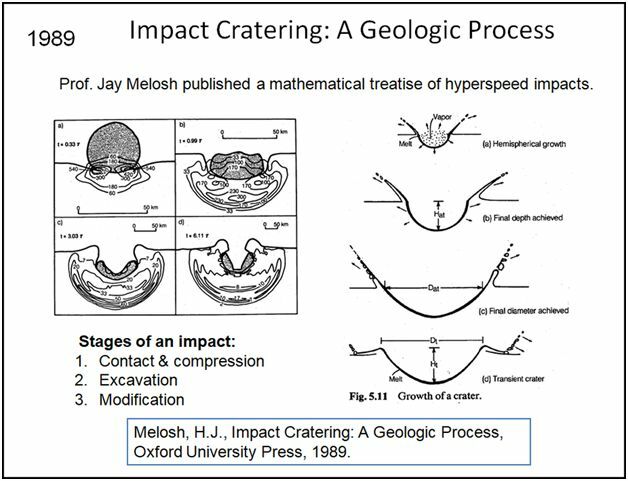 10) In 1989, Professor Jay Melosh published a book that became the standard for the analysis of extraterrestrial impacts. The book described cratering mechanics and incorporated all the mathematical knowledge that had been published about computer simulation of impacts. 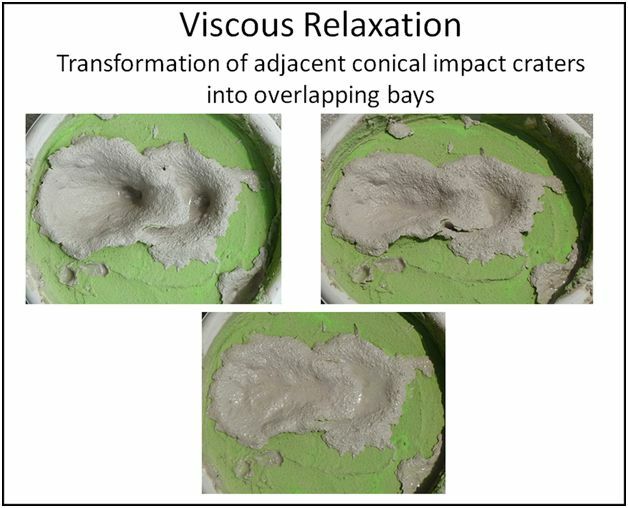 The book discussed the three main stages of an impact: Contact and Compression, Excavation, and Crater Modification. The book gave detailed descriptions of ejecta deposits, scaling of crater dimensions, and the aerodynamic interaction of asteroids entering the atmosphere. 11) The Landsat program for acquisition of satellite imagery of the Earth started in 1972. The images became very useful in agriculture, cartography, geology, forestry, regional planning and surveillance. Satellite imaging technology was mature by the end of the 1980s. 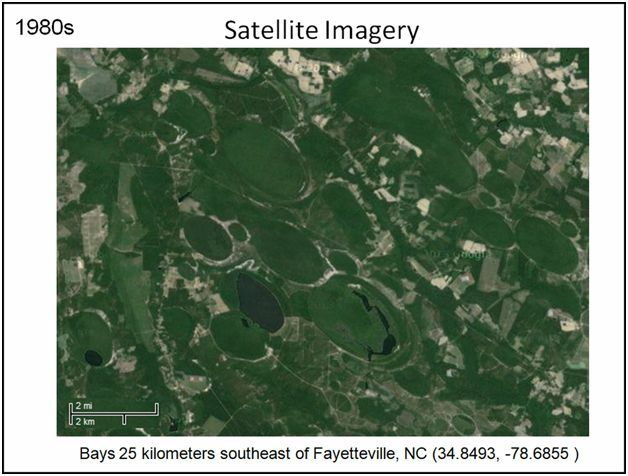 This image shows several Carolina Bays twenty-five kilometers southeast of Fayetteville, NC, but the farmed fields and vegetation interfere with the visualization of the bays. 12) Two technologies appeared in the 1980s that had application to the Carolina Bays. The U.S. Geological Survey (USGS) made available Digital Orthophoto Quadrangles that provided detailed images of geological structures not easily discernible from aerial photographs. 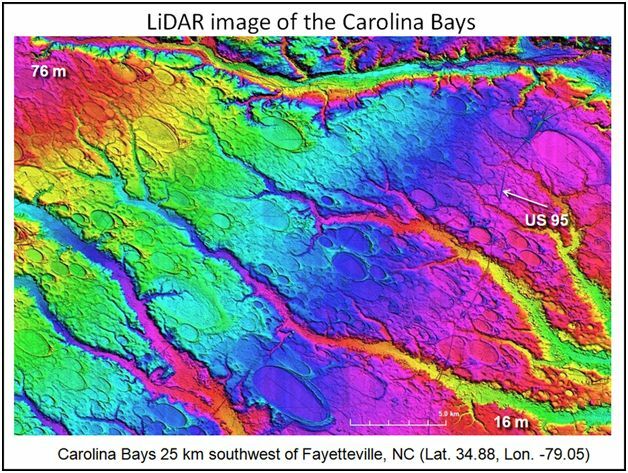 Also, LiDAR revolutionized surface imaging and it became the primary method of visualizing the Carolina Bays. The laser pulses used by LiDAR can show surface features in unprecedented detail. 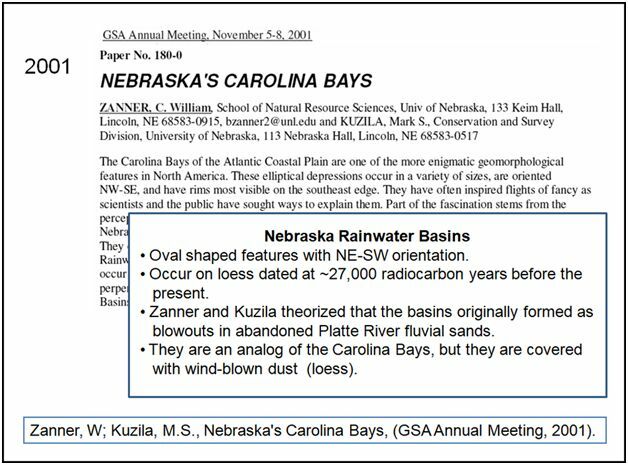 13) In 2001, Zanner and Kuzila announced that Nebraska also had geological structures similar to the Carolina Bays. The Nebraska Rainwater Basins were originally discovered by analysis of USGS Digital Orthophoto Quadrangles. The Nebraska Rainwater Basins are oriented from the northeast to the southwest, almost perpendicular to the orientation of the Carolina Bays. Zanner and Kuzila theorized that the basins formed as blowouts in abandoned Platte River fluvial sands. 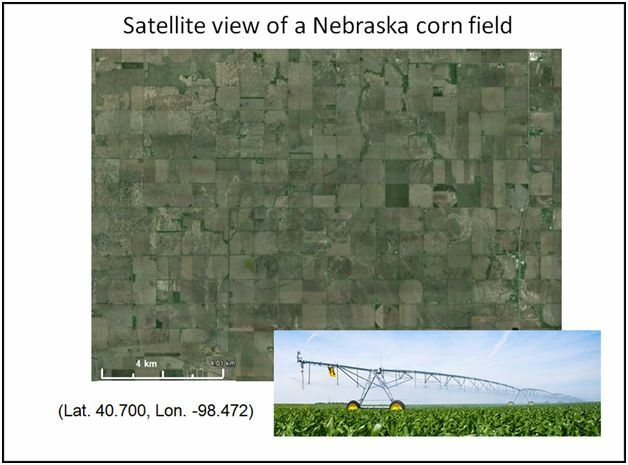 14) This picture has some large Nebraska Rainwater Basins, but they cannot be seen in aerial or satellite images. The most notable feature of this satellite image is a checkered pattern of half-mile farmland plots. Each of these squares is watered with a quarter-mile-long center-pivot irrigation system like the one illustrated in the inset. 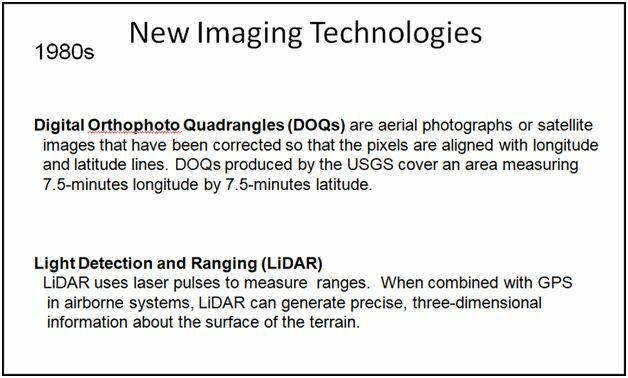 The next slide shows how LiDAR imaging makes a big difference in the visualization of geological features. 15) This is the same field viewed with LiDAR. The half-mile squares can be seen faintly, but the large elliptical features oriented in a northeast to southwest direction are clearly visible. The Nebraska Rainwater Basins show more water erosion than the Carolina Bays, and they have been covered to a great extent by wind-blown dust (loess). Nebraska Rainwater Basins smaller than two kilometers have disappeared due to erosion. 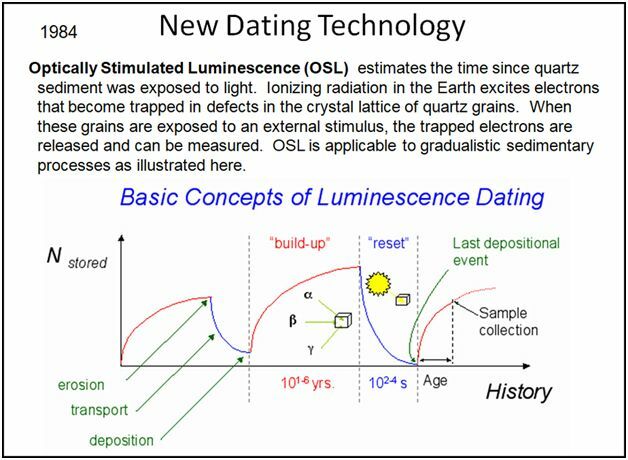 16) The introduction of Optically Stimulated Luminescence in 1984 revolutionized dating of sedimentary layers. The technique can date deposits from one year to several hundred thousand years. Radiation from the decay of Uranium (U), Thorium (Th), Rubidium (Rb) and Potassium (K) in the Earth cause electrons to become trapped in the defects of quartz crystals. Exposure to sunlight or intense heat releases the trapped electrons. Luminescence methods can be used to estimate the time since grains of quartz were last exposed to daylight by detecting their subsequent response to light of specific wave lengths. Optically stimulated luminescence (OSL) was developed in 1984 by David Huntley and colleagues. That the bays evolve over a long period of time. This paper was very influential in establishing the eolian and lacustrine origin of the Carolina Bays. The use of OSL, which measures the time since the last exposure to light for quartz sand, has a range well beyond radiocarbon dating, and makes it possible to correlate discontinuous regional records with the oxygen isotope records of global climate. 18) Also in 2007, Firestone and 25 co-authors proposed that an extraterrestrial impact caused the extinction of the North American megafauna and triggered the Younger Dryas cooling event. This paper reported magnetic microspherules and nanodiamonds at the Younger Dryas boundary that were said to be evidence that one or more large extraterrestrial objects exploded over North America destabilizing the Laurentide Ice sheet and causing extensive biomass burning. 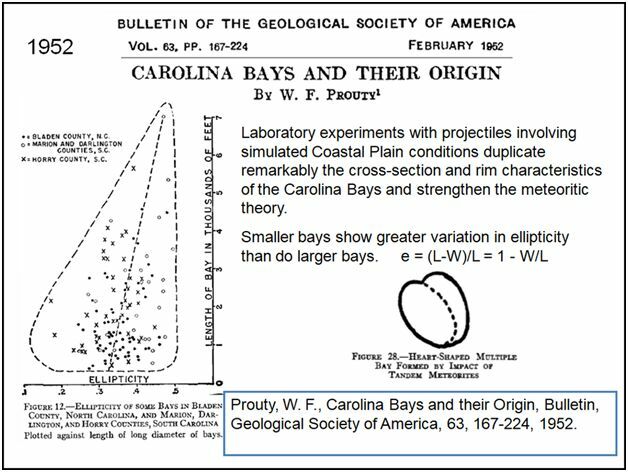 The authors of this paper took samples from 15 Carolina Bays because Melton and Schriever, and later Prouty had proposed that the bays had originated from an extraterrestrial impact. 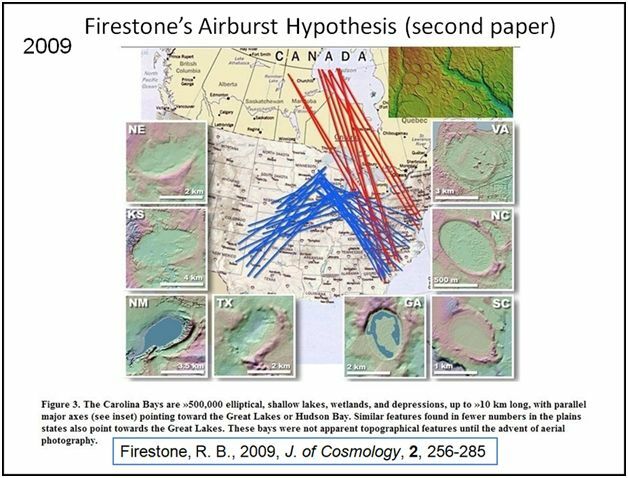 19) Firestone’s 2007 paper proposed that one or more large, low-density ET objects exploded over northern North America causing extensive biomass burning. 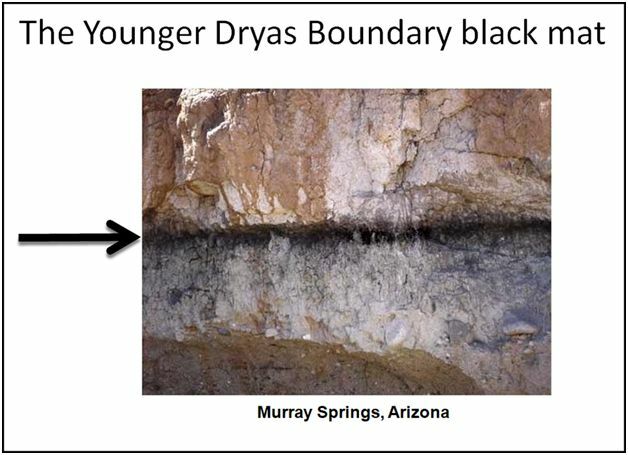 Many locations at the YDB boundary have a black, carbon-rich layer with charcoal, soot, carbon spherules and glassy carbon. 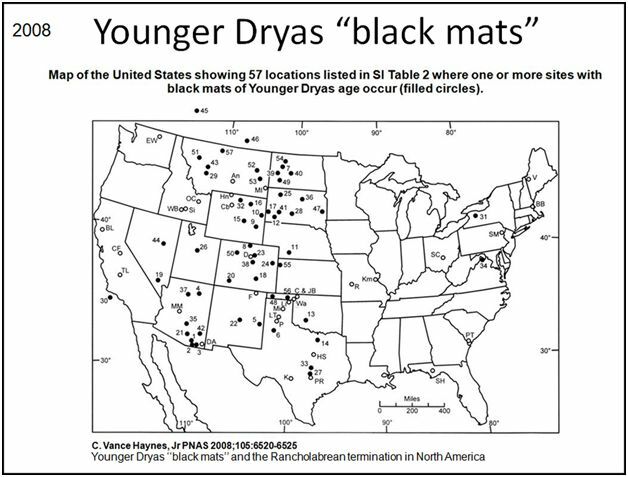 20) The Younger Dryas (YD) “black mats” are dark gray to black because of increased organic carbon (0.05–8%) compared with strata above and below. The layers represent relatively moist conditions different from those before or after their time of deposition as a result of higher water tables. It is interesting to note that the black mats are found far away from the proposed impact site by the Great Lakes. 21) In 2009, the TV program NOVA popularized the Younger Dryas Impact Hypothesis. Although overhunting by humans and climate change were discussed as possibilities for the disappearance of the mammoths and other large animals, an extraterrestrial impact was considered a very likely cause of the extinction. In the TV show, Prof. Peter Schultz from Brown University was shown studying how a layer of ice shields the Earth’s surface. The video demonstrated that a high-speed impact on a layer of ice ejects pieces of ice radiating from the point of impact, and the surface under the ice is only slightly disturbed, but no crater forms. Prof. Schultz published his research in 2012. 22) In 2009, Firestone replied to the criticism about the 2007 paper. 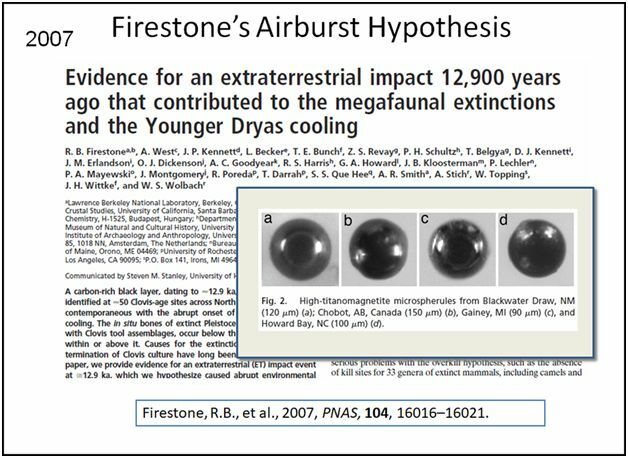 Firestone maintained that the spherules at the Younger Dryas Boundary were suitable indicators of an extraterrestrial airburst, and that the conflicting dates for the Carolina Bays could have resulted from inadvertent sampling of older sediment that may have shifted over time. Firestone had proposed that a meteor had exploded in an airburst because there was no extraterrestrial impact crater. In this paper, he also suggested that the Laurentide ice sheet could have shielded the ground and prevented the formation of a crater, as proposed by Prof. Schultz. Firestone stated that the radial alignment of the Carolina Bays and the Nebraska Rainwater Basins was an indication of an extraterrestrial explosion in the Great Lakes or Hudson Bay, as shown in this figure from his paper. He attributed the formation of the elliptical depressions to the wind from a shockwave, which he said was consistent with the theory that the bays were eolian in origin as proposed by previous researchers. 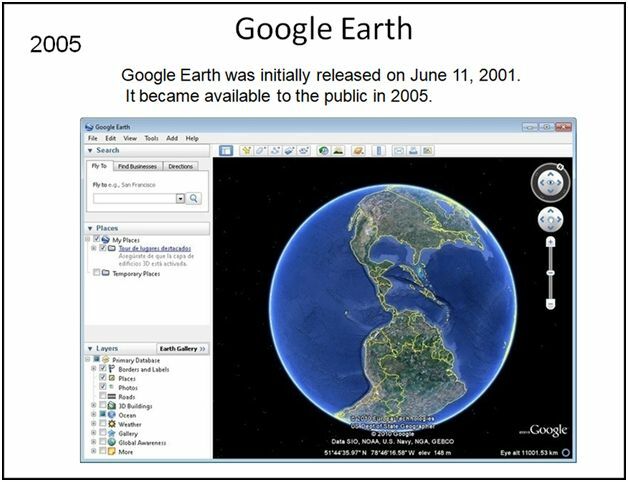 23) Starting in 2005, Google Earth changed the way in which we view the world. Anyone with a personal computer could now explore the surface of the Earth. Google Earth has helped to find lost ancient cities and meteorite impact craters in remote locations. Google Earth has become important for teaching geologic map interpretation using its interactive 3D terrain viewing capability. The use of overlays, such as LiDAR maps, makes Google Earth a very flexible tool. 24) Compared with satellite images, LiDAR makes it possible to see the Carolina Bays without interference from vegetation. This Digital Elevation Map covers ~600 square km southwest of Fayetteville, NC. The color gradient corresponds to the topographic elevation, from 16 m above sea level in the lower right, to 76 m above sea level in the upper left. Interstate 95 can be seen as a thin dark line on the right. 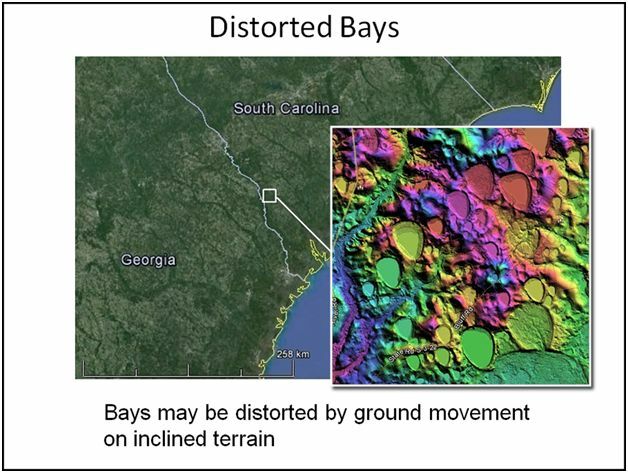 LiDAR images made it possible to see that all the Carolina Bays are elliptical, but that many have been modified by water erosion and ground movement. This image was produced by Michael Davias, who established a database of LiDAR images that can be viewed with Google Earth. 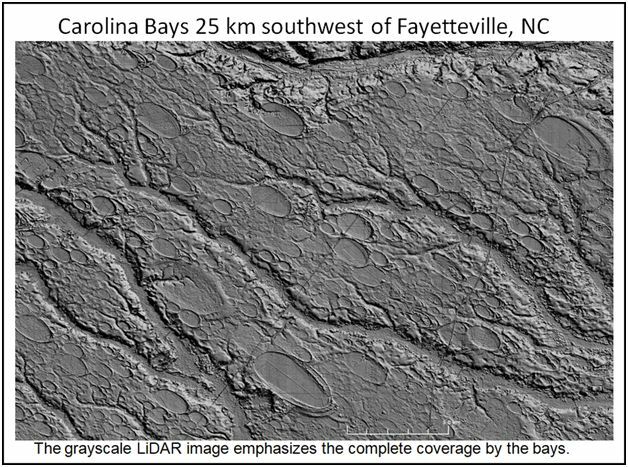 25) The grayscale image emphasizes the complete coverage of the land by Carolina Bays. 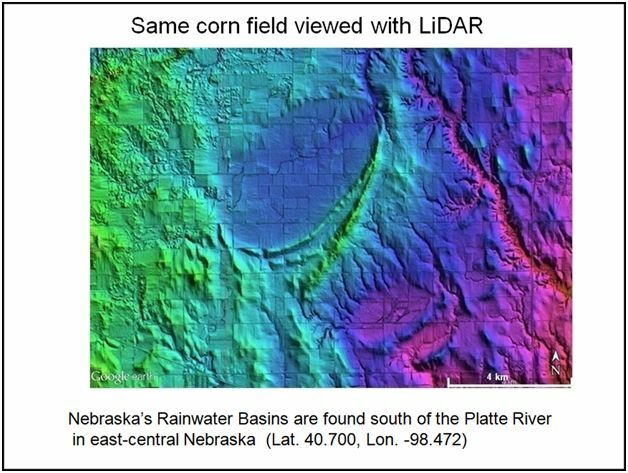 26) By 2010, Michael Davias had integrated hundreds of LiDAR images of Carolina Bays and Nebraska Rainwater Basins with Google Earth. He used great circle trajectories adjusted for the Coriolis effect to calculate the convergence point of the bays. Previous attempts by others to find a focal point had failed because they had used straight lines on flat maps and they had ignored the flight time of the projectiles. Davias benefitted from having Google Earth to perform the triangulation. Davias proposed that a low-density extraterrestrial projectile had ejected a curtain of glacial ices, sedimentary strata, and material from the impactor. According to his hypothesis, the Carolina bays formed when large steam bubbles burst, leaving shallow cavities with sandy rims. 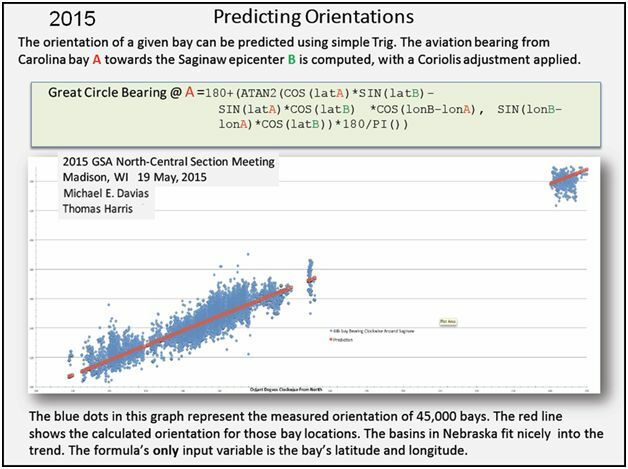 27) By 2015, Davias had used the orientation of 45,000 bays to derive a trigonometric equation to calculate the azimuthal orientation of the Carolina Bays and Nebraska Rainwater Basins just from their coordinates. In this image, the red line is the calculated orientation adjusted for the Coriolis effect, and the blue dots are the actual measured orientations of the bays. Saginaw Bay in Michigan is used as the convergence point of the bays. 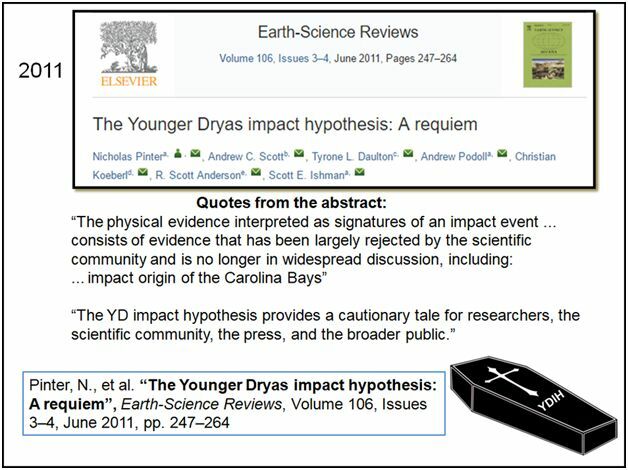 28) In 2011, seven university professors from the U.S., the UK and Austria collaborated on a “requiem” paper declaring the death of the Younger Dryas impact hypothesis. In the Roman Catholic Church, a requiem is a Mass for the repose of the souls of the dead. The paper went point-by-point over Firestone’s claims and showed that none of his evidence could be conclusively considered indicative of an extraterrestrial impact. Firestone’s papers had not shown an impact crater, meteorite fragments, petrographic shock metamorphism, enrichment of siderophile elements or other criteria established by impact science. The microspherules reported by Firestone had not been established by any previous research as a specific characteristic of extraterrestrial impacts. The requiem paper referenced the 2007 publication by Ivester that described an episodic formation process for the Carolina Bays. The requiem paper was very influential in stopping funding and research on the Carolina Bays. 29) In spite of the efforts to kill it, the idea of an extraterrestrial impact at the Younger Dryas Boundary refused to die. In 2012, several papers evaluated the microspherule evidence, and additional microspherules were found in Mexico. In 2013, Wittke and 27 other collaborators quantified the amount of microspherules attributed to an extraterrestrial impact across four continents. Although the microspherules continued to be contested as evidence of an extraterrestrial impact, the large platinum anomaly reported by Petaev and his Harvard University co-authors added additional support. 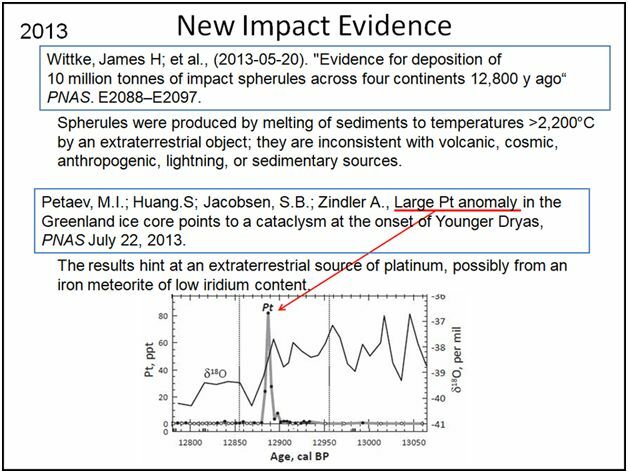 The platinum spike found by the Harvard team was definitely a siderophile element that could have originated from an extraterrestrial impact at the Younger Dryas Boundary. 30) Many researchers had described the Carolina Bays as either oval or elliptical, but nobody had done a geometrical analysis to verify whether the bays were truly elliptical. In 2013, using Google Earth with LiDAR overlays, I found that an ellipse with the same width-to-length ratio as a Carolina Bay fit the bay exactly after scaling and rotating the ellipse. The bays can be measured with Google Earth’s measuring tool, and a graphics program such as Photoshop can be used to manipulate ellipses and superimpose them on captured images of the bays. In general, the fit is so good that it is possible to conclude that the archetypal shape of the Carolina Bays is elliptical and that the bays can be modeled as mathematical conic sections. Many bays have been deformed by terrestrial processes and human activity, but the bays that are well preserved have an elliptical shape. Some exceptions will be mentioned later. 31) The elliptical geometry is a characteristic of small and large bays. The Carolina Bays are shallow elliptical depressions with raised rims on unconsolidated ground whose major axis is oriented toward the Great Lakes. The size of the bays varies from about one hundred meters to several kilometers in size. The bays are found on sandy soil close to the water table along the East Coast of the United States. 32) The Nebraska Rainwater Basins have been greatly degraded by wind and water erosion, but the ellipse-fitting procedure can still be used for the basins that have maintained well-defined borders. It is not possible to fit an ellipse to basins whose width and length cannot be measured with precision. The center of this image shows two such basins. 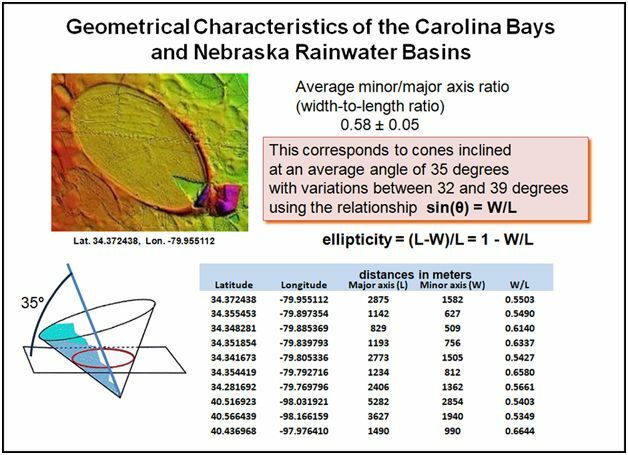 Comparison of the geometry of the Nebraska Rainwater Basins and the Carolina Bays revealed an interesting correlation. 33) Measurements show that the Carolina Bays and the Nebraska Rainwater Basins have the same ellipticity even though they have different axial orientations and they are separated by 2000 kilometers. The elliptical shapes correspond to cones inclined at about 35 degrees. The bays represented in this table have ellipticities within the ranges described by Prouty in 1952. 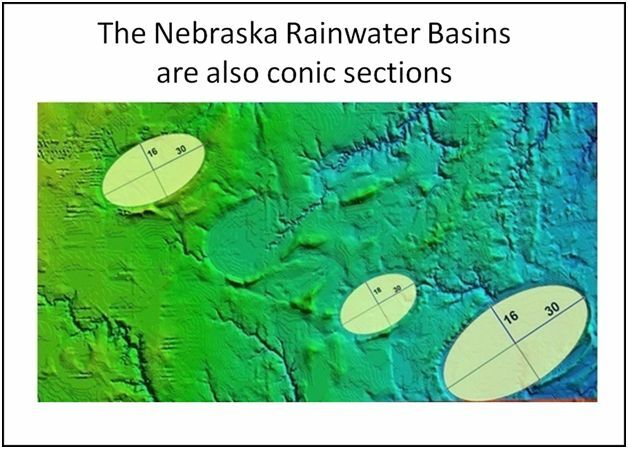 Statistical analysis of the width-to-length ratios of the Carolina Bays and Nebraska Rainwater Basins showed that they cannot be distinguished on the basis of their geometry. The occurrence of elliptical features with identical geometry in Nebraska and in the East Coast radiating from a convergence point in Michigan requires a better explanation than just eolian and lacustrine mechanisms that cannot guarantee the shape or orientation of the resulting structures. A new hypothesis was needed to explain the facts revealed by the geometrical analysis. 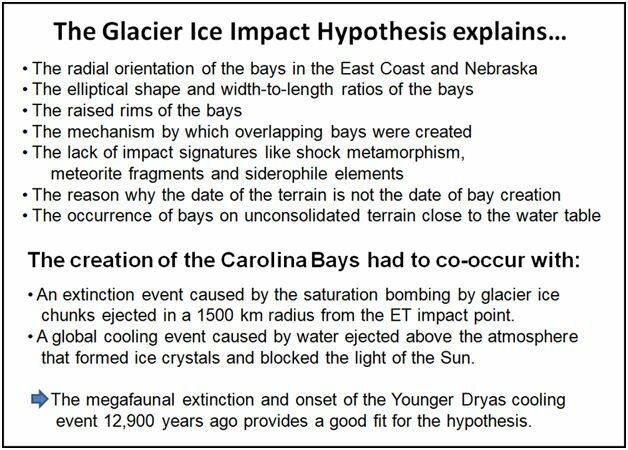 34) In 2013, I developed the Glacier Ice Impact Hypothesis, and I identified four mechanisms that were necessary for the formation of the Carolina Bays. First, during the ice age, a meteorite impact on the Laurentide Ice Sheet in Michigan ejected ice boulders in ballistic trajectories. Next, the secondary impacts by the ice boulders liquefied unconsolidated ground close to the water table. Finally, viscous relaxation reduced the depth of the conical cavities to produce shallow elliptical bays. 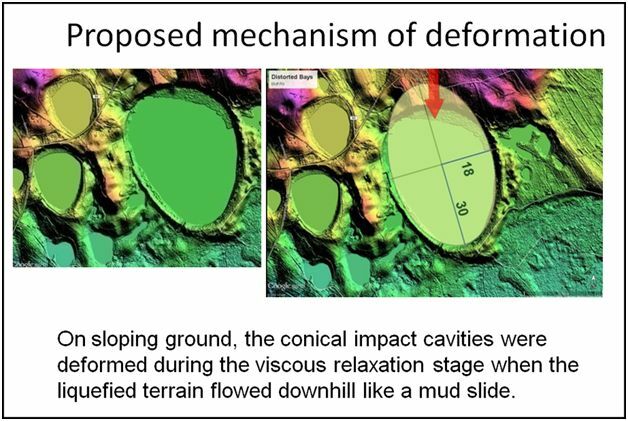 Previous impact hypotheses for the formation of the Carolina Bays had not considered soil liquefaction by the secondary impacts and the formation of conical craters. 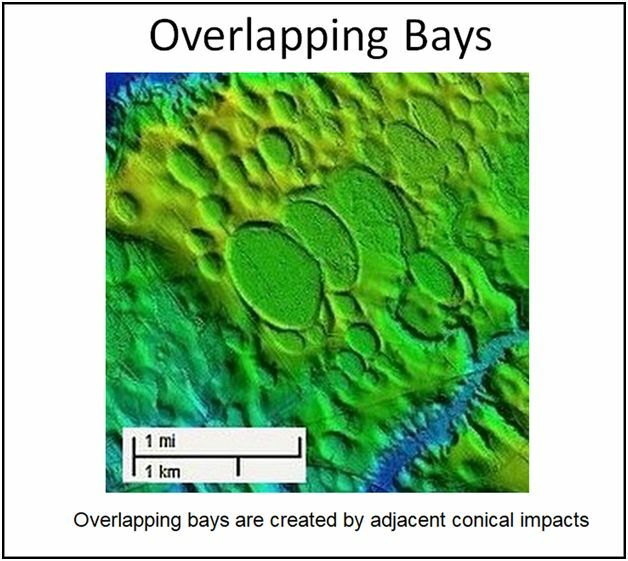 The Carolina Bays are the remodeled remains of oblique conical craters formed on ground liquefied by the seismic shock waves of secondary impacts of glacier ice boulders ejected by an extraterrestrial impact on the Laurentide ice sheet. For reference, the International Space Station (ISS) maintains an orbit with an altitude of between 330 and 435 km. 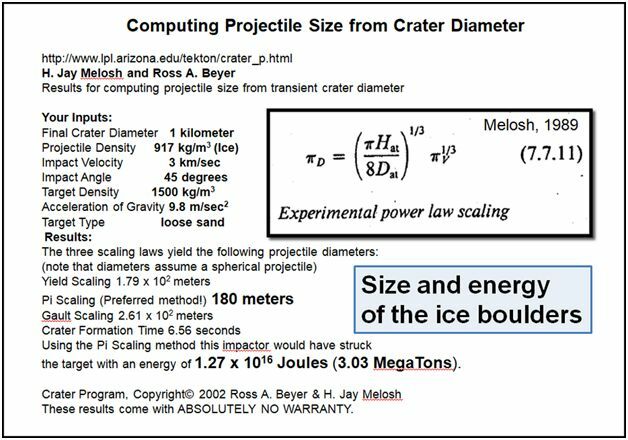 36) Knowing the speed of the ice boulders, we can use scaling laws relating energy to crater size for estimating the mass of the projectiles. The scaling laws were derived from detonations of chemical explosives and nuclear bombs in the 20th century. The University of Arizona had a program that implemented the scaling equations from Prof. Melosh’s 1989 book. With this program, I calculated that a Carolina Bay with a diameter of 1 kilometer could have been created by an impact of an ice sphere with a diameter of 180 meters traveling at 3 km/sec with an energy of 3 Megatons. 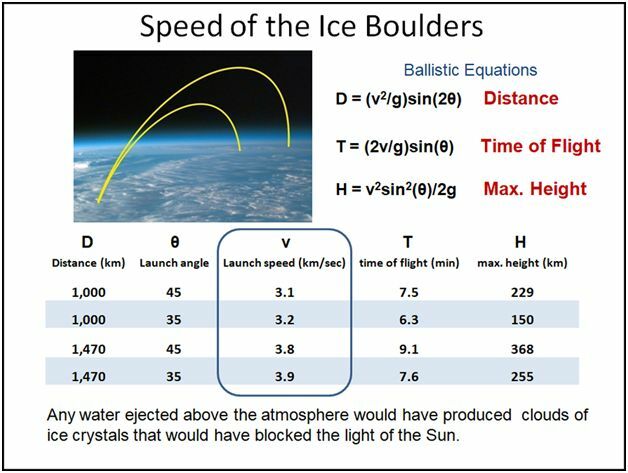 The size and the energy of the ejected ice boulders can also be used to estimate some of the characteristics of the extraterrestrial impact. 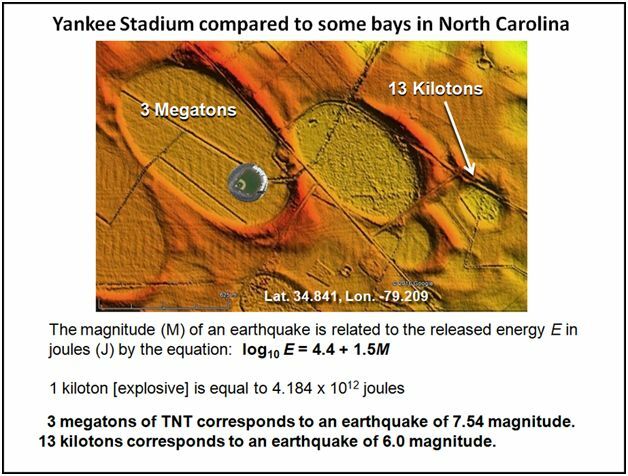 If we consider that there are about half a million Carolina Bays, the combined energy would be the approximate energy of the extraterrestrial impact, which corresponds to an impact by an asteroid with a diameter of 3 kilometers. (~6.35 × 1021 Joules). From the combined volumes of the projectiles, we can also calculate that the amount of ice ejected by the extraterrestrial impact would cover half of the United States to a depth of half a meter. (~1.5 × 1012 cubic meters of ice). 37) This image helps to visualize the size and the energy of the ice projectiles that created the bays. The large bay on the left has a major axis of 950 meters. Yankee stadium measures approximately 180 meters in diameter. The stadium is about the same size as the glacier ice boulder that made the bay. The impact would have had an energy of about 3 megatons of TNT, corresponding to an earthquake of 7.54 magnitude. The smaller bay to the right has a major axis of 220 meters, which is 40 meters bigger than Yankee Stadium. This bay was made by the impact of a 28-meter ice boulder with an energy of 13 kilotons of TNT, which corresponds to a 6.0 magnitude earthquake. This is comparable to the bomb dropped on Hiroshima, which had a yield of 15 kilotons. The correlation of the impact energy with earthquake magnitude shows that the glacier ice impacts that formed the bays had sufficient energy to liquefy saturated ground. 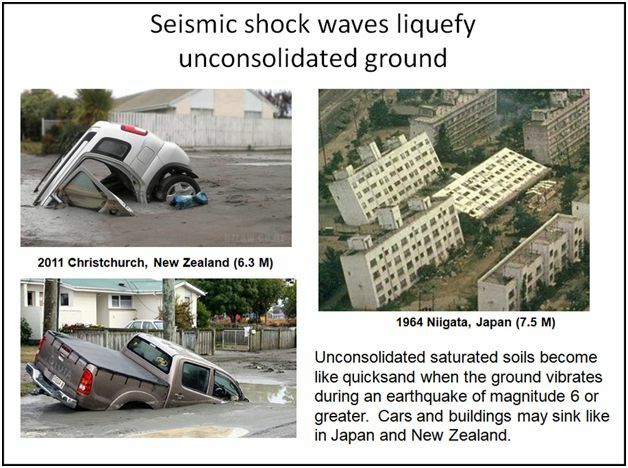 38) This slide illustrates the liquefaction of saturated soil subjected to seismic vibrations of magnitude 6.0 or higher. The 2011 earthquake in Christchurch, New Zealand had a magnitude of 6.3 and produced significant liquefaction that swallowed cars. Even smaller aftershocks of magnitude 5.7 caused liquefaction. The 1964 earthquake in Niigata, Japan had a magnitude of 7.5 and it liquefied the ground and toppled buildings. The energy of the earthquake was equivalent to about 3 megatons of TNT. The shock waves of the secondary glacier ice impacts of 13 kilotons to 3 megatons had enough energy to liquefy saturated soil and set up the conditions necessary for the formation of conical impact cavities. 39) This map shows the depth to water in North Carolina. 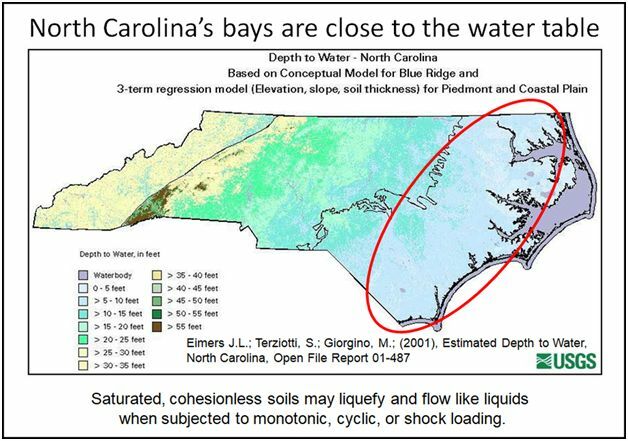 Carolina Bays occur in the Coastal Plain where the water table is within 1.5 meters from the surface. The seismic waves of the extraterrestrial impact in Michigan traveling at 5 km/sec would have reached the Eastern seaboard approximately 3.5 to 4.5 minutes later. These shock waves may not have had enough energy to liquefy the soil after traveling more than 1000 kilometers. However, the intense bombardment by the secondary impacts of huge ice boulders with energies of 13 kilotons to 3 megatons would have definitely liquefied the surface. Even if the initial impacts had struck solid unconsolidated ground, the impacts occurring shortly thereafter would have found soil liquefied by the seismic vibrations of the preceding impacts. 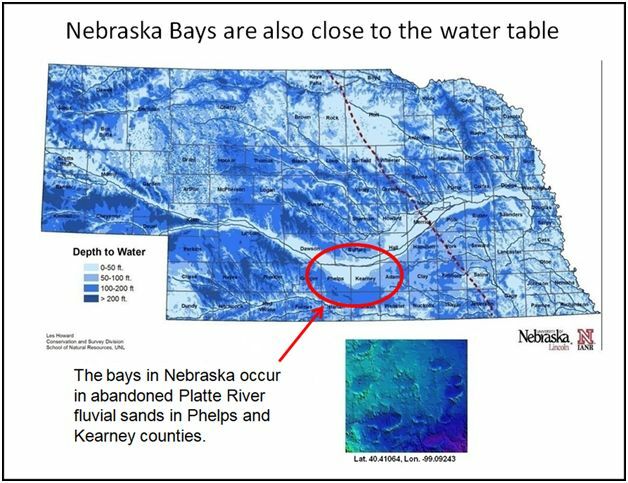 40) The Nebraska Rainwater Basins are also close to the water table. The bays occur in abandoned Platte River fluvial sands on terrain that is 600 to 700 meters above sea level. Like in the East Coast, the seismic vibrations of the secondary impacts would have liquefied the ground, setting up the right conditions for the creation of conical cavities. The projectile must not disintegrate as it enters and travels through the medium because if the projectile disintegrates on contact, all the kinetic energy is released at once, creating a hemispherical shock wave that produces the typical bowl-shaped crater. The medium must be viscous, but not elastic. In a viscous medium with low elasticity, the projectile travels until it is stopped by friction, creating a conical cavity. If the medium is elastic, the conical cavity collapses after the passage of the projectile, leaving only a tubular trail. 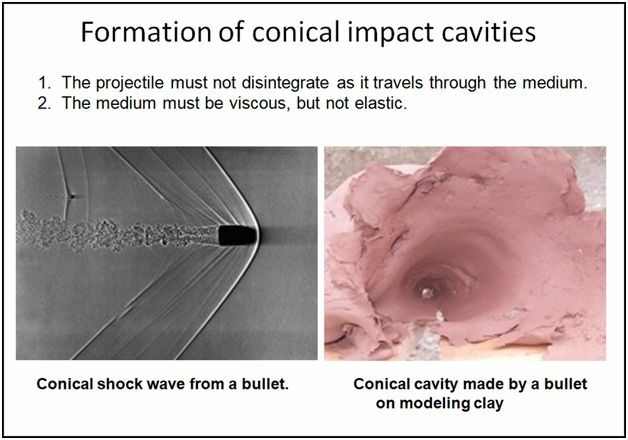 42) In order to test the formation of conical cavities and viscous relaxation, I had to design experiments to evaluate various impact conditions. After some trial and error, I was able to get reproducible results using equal amounts of pottery clay and sand with enough water to have the consistency of bricklayer’s mortar. A thin layer of colored sand was used to enhance visualization. I used a slingshot to fire the ice projectiles. 43) The experimental conical impact cavities are created in fractions of a second. If you blink you miss them. The formation of a cavity for a one-kilometer Carolina Bay would have taken approximately 6.5 seconds, according to the scaling laws. 44) This is a side view of two adjacent impacts. 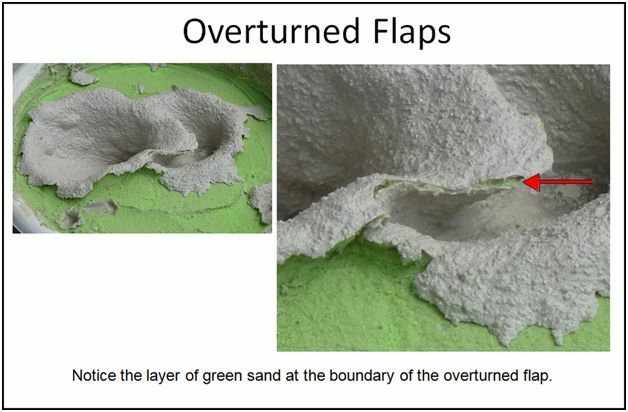 A layer of green sand can be seen at the boundary of the overturned flap. 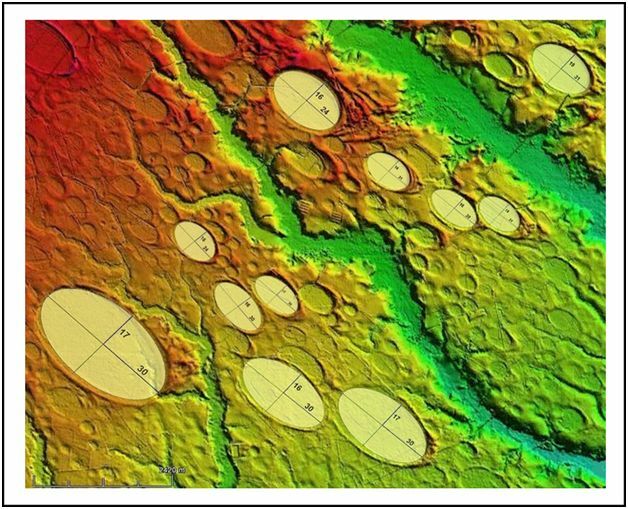 A geological survey would look for inverted stratigraphy in the rims to establish the impact origin of the Carolina Bays. 45) The raised rims of Carolina Bays correspond to overturned flaps formed in the direction in which the projectile was traveling. 46) Overlapping bays are formed from adjacent conical impacts as illustrated in the next slide. 47) Here we see how adjacent conical craters become overlapping bays. 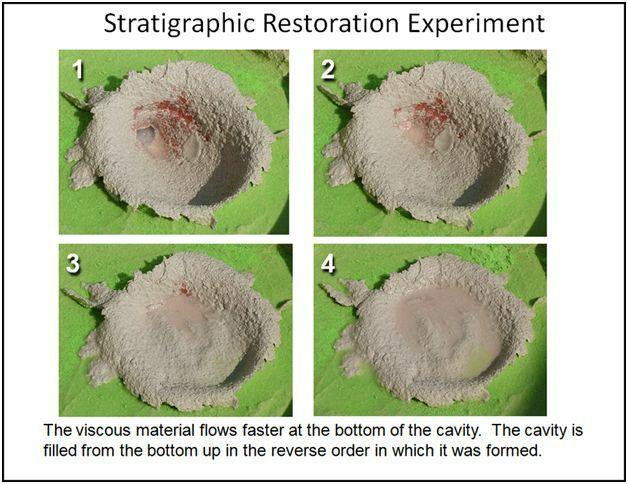 Viscous relaxation driven by gravity decreases the depth of craters and partially reconstitutes the stratigraphy by the flow of material parted during the excavation. Shaking the container speeds up viscous relaxation by promoting liquefaction. During the formation of the Carolina Bays, the seismic vibrations of nearby impacts would have speeded viscous relaxation. The overlaps follow the principle of superposition. A bay that covers another one was created later in time. 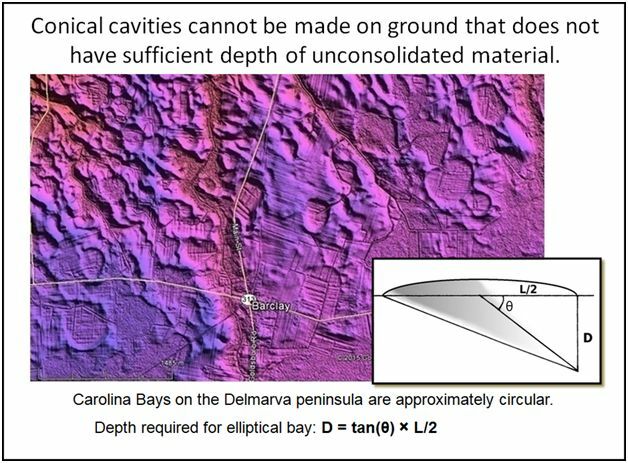 48) One of the arguments used against the impact hypothesis of the Carolina Bays is that their subsurface appears undisturbed. A projectile at ballistic speed penetrates a viscous surface by parting the existing layers of the target during the excavation phase of the impact. Viscous relaxation driven by gravity partially reconstitutes the stratigraphy by flow of the material parted during excavation. 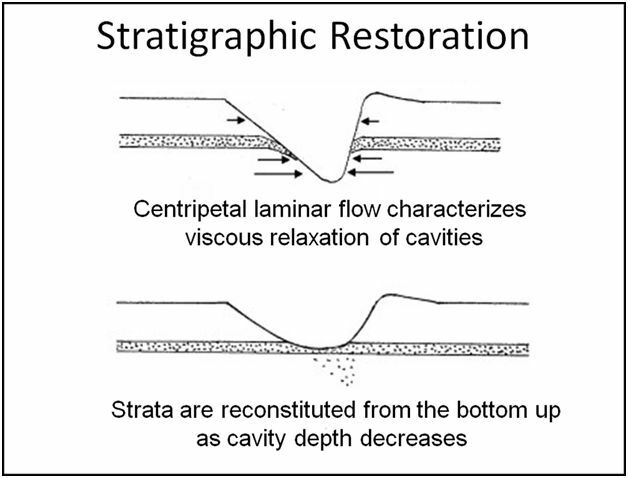 Hydrostatic pressure increases with depth and promotes faster centripetal lateral flow at the bottom of a cavity in a uniformly viscous medium. 49) The photographs show an oblique conical cavity made by an ice projectile that went through a red layer in the medium. During viscous relaxation, the depth of the cavity is gradually reduced as the viscous material adjacent to the deepest part flows to fill the cavity. The red layer remains at the same level and disappears from view when the cavity is filled by centripetal lateral flow of material from the bottom up. 50) In this experiment, a newly made cavity is covered with a thin layer of red sand to see if any additional surface is exposed to light during viscous relaxation. Optically Stimulated Luminescence (OSL) estimates the time since last exposure to sunlight for quartz sand and similar materials. The use of OSL for dating the bays has assumed that the subsurface of the Carolina Bays was exposed to light at the time of bay formation in a gradualistic depositional process. However, the experimental model shows that impacts on viscous surfaces are plastic deformations that do not expose the subsurface to light. 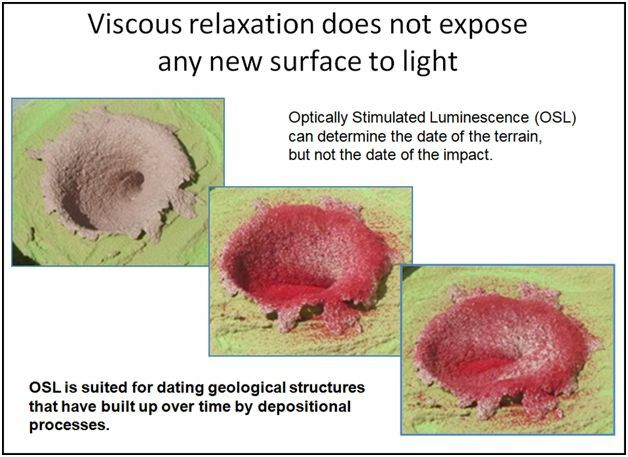 Viscous relaxation restores the original stratigraphy without causing additional exposure to light. Dissociating the date of the terrain from the date of the bay structures makes it possible to propose that all the Carolina Bays could have been created contemporaneously even though the terrain could have widely varying dates. A conical cavity inclined at 35 degrees corresponding to a bay with a major axis of 400 meters would require a layer of 140 meters of unconsolidated material. 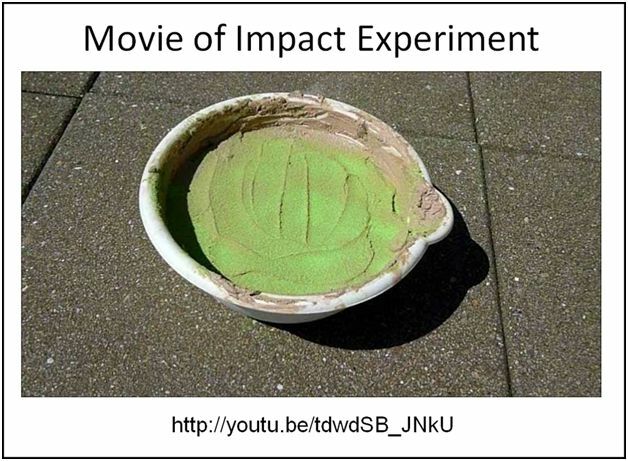 An ice projectile impacting a surface covered with a shallow layer of unconsolidated material would disintegrate explosively upon encountering a hard layer, which would then create a hemispherical shock wave to produce a circular crater. 52) This is another example of circular bays near Mappsville, Va.
53) These distorted bays are found close to the banks of the Savannah River. Notice the color gradient indicating sloping terrain. The bays have a flattened shape toward higher terrain. 54) These tear-drop shaped bays can be explained by noting that the flattened ends of the ellipses are adjacent to areas of higher elevation, and that mud slides could have changed the shapes of the bays. 55) The experimental model makes it possible to test this hypotheses of bay formation. 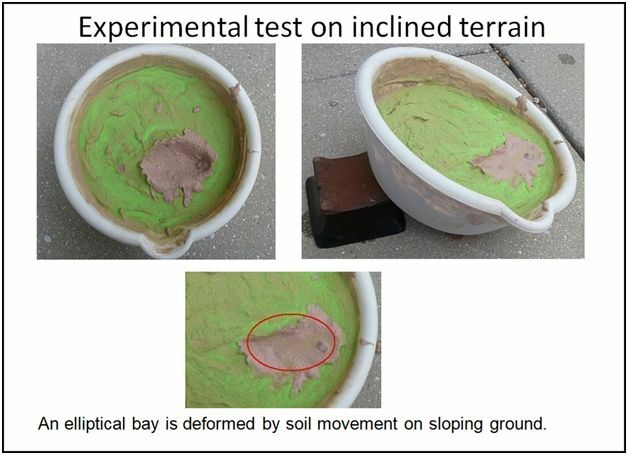 This experiment shows an elliptical impact cavity that is deformed during viscous relaxation when the terrain is inclined. The deformation is caused by soil flowing downhill toward the cavity after the formation of the conical cavity. The resulting structure bears some similarity to the bays near the Savannah River. It is important to note that since ice is less dense than the liquefied soil, it floats at the distal end of the ellipse. This may make it possible to find clasts carried by the glacier boulders near the surface of the bays, rather than deep at the apex of the conical cavities. 56) This is a summary of the events proposed by the Glacier Ice Impact Hypothesis and deduced from ballistic equations and scaling laws. 57) In the vacuum of space, water can only exist as solid ice or water vapor. 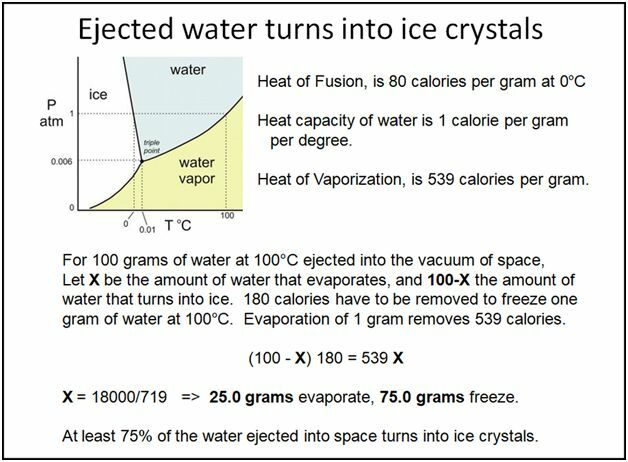 Using thermodynamics, we can estimate that at least 75% of the water ejected above the atmosphere turned into ice crystals that would have blocked the light of the sun. The ice crystals would have eventually sublimated, ending the cooling event. 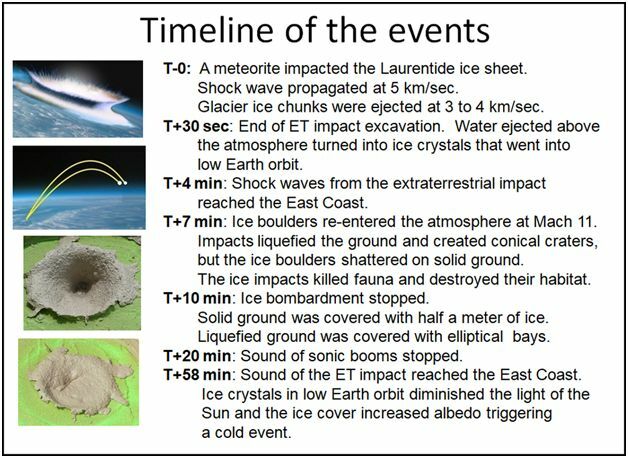 From the duration of the Younger Dryas, it is possible to get a rough estimate of the water ejected by the extraterrestrial impact on the Laurentide Ice Sheet. 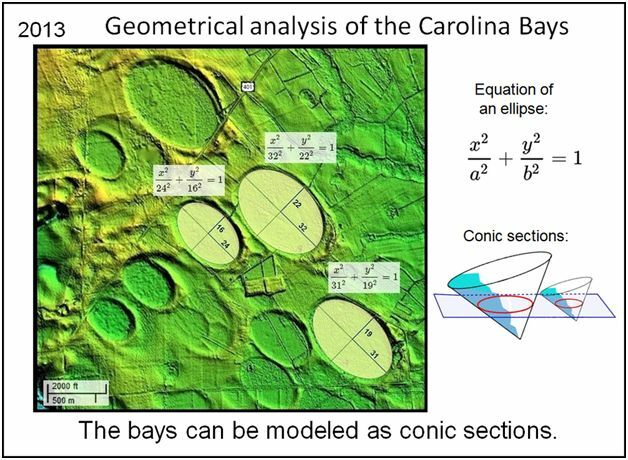 58) Ballistic equations, laws relating energy to crater size, geometrical analysis, and a physical model for producing conical cavities are powerful tools for analyzing the Carolina Bays. 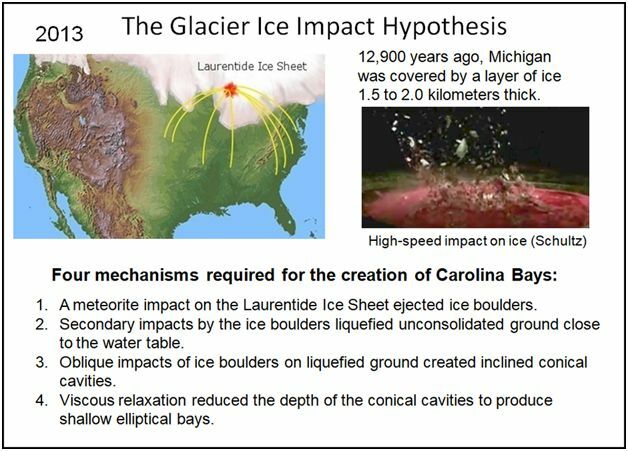 59) My paper proposes that the Carolina Bays were produced by a saturation bombardment of glacier ice chunks ejected by an extraterrestrial impact on the Laurentide Ice Sheet. Water ejected above the atmosphere would have produced a cloud of ice crystals that blocked the light of the Sun. Thus, the formation of the Carolina Bays has to coincide with an extinction event on the eastern half of the United States and the onset of a global cooling event. This combination of conditions happened approximately 12,800 years ago. Look at the density of the Carolina Bays and consider their energy of formation. Where could you have stood to avoid being hit by a giant ice boulder? If you survived, where would you get your next meal? 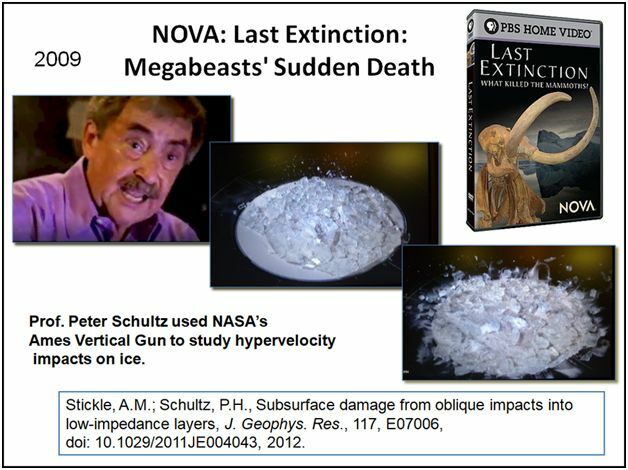 60) In 2014, I published a small book entitled “Killer Comet” describing the YDB extinction event and the Glacier Ice Impact Hypothesis. 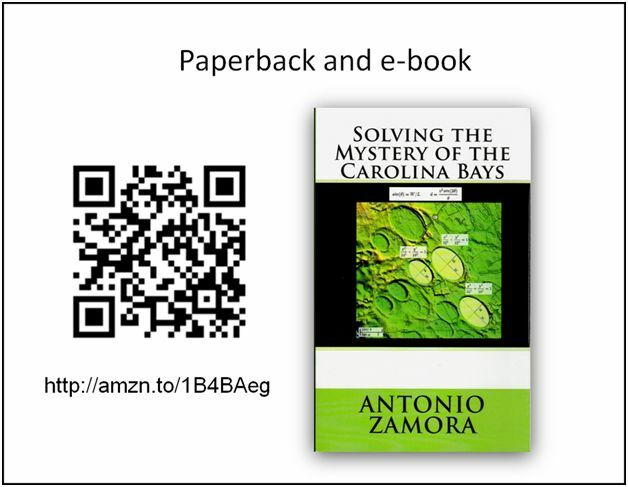 In 2015, I published a more technical book “Solving the Mystery of the Carolina Bays” describing the geometrical analysis of the bays, additional experiments supporting the impact hypothesis, and the thermodynamics of water ejected above the atmosphere. I presented a copy of the second book to Dr. Richard Carlson, Director of the Department of Terrestrial Magnetism of the Carnegie Institution of Washington, and he suggested that I should submit a paper to a peer-reviewed publication. My article entitled “A model for the geomorphology of the Carolina Bays” appeared in 2017 in the April issue of the journal Geomorphology.